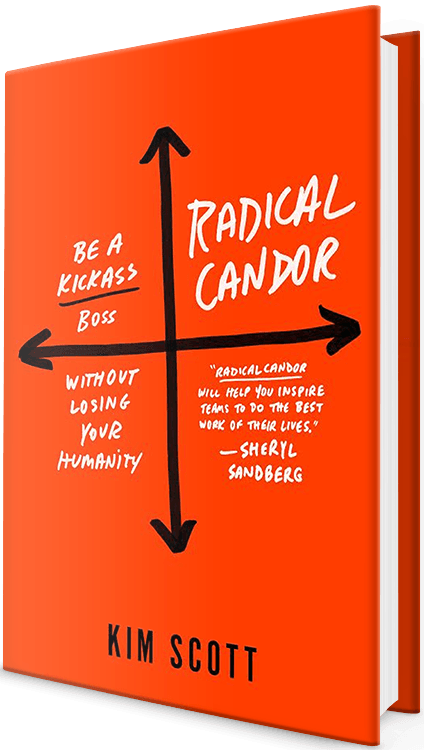 Kim Scott is the author of the NYT & WSJ bestseller Radical Candor: Be a Kickass Boss without Losing your Humanity. Kim led AdSense, YouTube, and Doubleclick Online Sales and Operations at Google and then joined Apple to develop and teach a leadership seminar. Kim has been a CEO coach at Dropbox, Qualtrics, Twitter, and several other tech companies. Previously, Kim was the co-founder and CEO of Juice Software, a collaboration start-up, and led business development at Delta Three and Capital Thinking. Earlier in her career, she worked as a senior policy advisor at the FCC, managed a pediatric clinic in Kosovo, started a diamond cutting factory in Moscow, and was an analyst on the Soviet Companies Fund. Kim received her MBA from Harvard Business School and her BA from Princeton University. She is the author of three novels; she and her husband Andy Scott are parents of twins and live in the San Francisco Bay Area. Sign up for Kim Scott newsletter, and more.